While walking by this antique shop early in the morning I spotted the resident cat grooming itself in the sun. When I stopped the kitty threw itself onto the ground as if begging for a tummy rub. Too bad the shop was still closed! Taking part in Saturday's Critters. Click HERE to see more creatures from around the world. 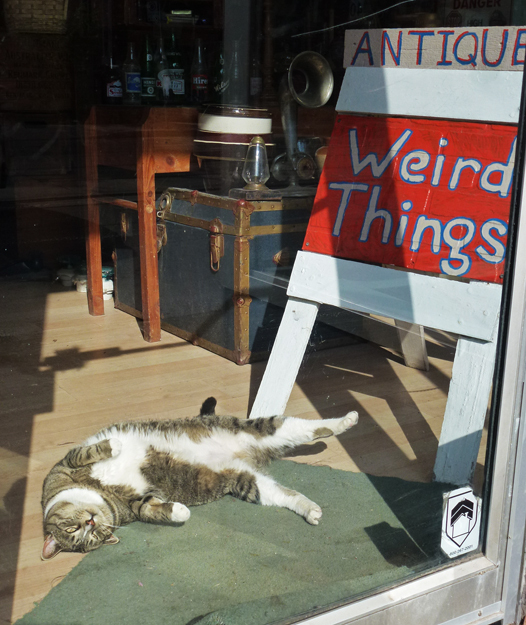 That is one relaxed cat under a funny sign. Nothing weird about the sunshine. Hello, the kitty is insisting on a belly rub. LOL, what a cute shot. Thank you so much for linking up and sharing your post. Happy Saturday, enjoy your day and weekend! This is rather strange, but I've been in several antique stores that had cats that behaved rather like this one. I wonder if it's the smell in antique stuff? Cute shot, whatever! Who is good lookin' kitty? Perfect sign for the cat. Oh my gosh, that is so funny! Awww...I bet he's a sweetie when there are customers in the shop! Ha, cute kitty and cute sign! Not antique but also not wrong and an enrichment of the shop window. I like it. Oh those pussycats love the warm spots 😀 Well spotted Pat!